Richmond has a prominent hill on its western boundary, known as Richmond Hill but also as Dockers Hill. It is surmounted by four church spires. The land falls away to the river in the east, to the Collingwood flat in the north and to the flat land of Burnley in the south. Richmond was subdivided into allotments of about 12 hectares by the government surveyor, Robert Hoddle, in 1839. Most were purchased speculatively. Richmond Hill was occupied by Farquhar McCrae (surgeon, suburban speculator) and Joseph Docker. McCrae subdivided his land into smaller allotments in a couple of years, but Docker's land, from Punt Road to Church Street, backing up to Richmond Terrace, was not all sold until the 1860s. He donated the land on which St Stephens Anglican (1850) church was built. The main easterly thoroughfare through Richmond was Bridge Road, which crossed the Yarra River to Hawthorn by a punt (1843), and later a bridge. A settlement named Yarraberg was formed, north of Bridge Road and east of Burnley Street, in 1853. It is one of Melbourne's oldest industrial areas, although at the beginning it was a mixture of villas, tanneries and brickworks. David Mitchell, father of Nellie Melba, began a brickworks there in 1852. By the mid-1850s Bridge Road had an established retail and service strip between Punt Road and Church Street. Swan Street was slightly less developed, but the Whitehorse Hotel's outer structure (1849-55) still stands at 250-252 Swan Street. In 1856 the entrepreneur George Coppin purchased the area known as Cremorne, including Cremorne Gardens. When the railway entered Richmond two branches diverged from Richmond station on the west side: one went eastwards through Burnley to Hawthorn and the other through Cremorne to South Yarra. Cremorne later became industrialised, the premier landmark being the Rosella jam and sauce factory. Cremorne became a suburb in 1998 and has its own entry. Three church primary schools were opened early in the 1850s: St James Catholic school (1850) in Abinger Street, off Church Street; St Stephens Anglican school (1851); and the Wesleyan school (1853), still standing at the rear of the Wesleyan church of the same year at 300 Church Street. Anglican and Presbyterian schools were opened at Cremorne in 1857 and 1862, and a National School in Lennox Street in 1858. Some notable citizens built in Richmond. Robert Hoddle's ‘Millewa’ and speculator William Highett's ‘Yalcowinna’ were incorporated in the Bethesda and Epworth Hospitals in Erin Street. George Coppin moved to Richmond Hill, next to James Henty (son of Portland pioneer, Thomas Henty), who built ‘Richmond Hill’. Both properties fell to the Pelaco shirt factory. During the 1870s and 1880s Richmond underwent industrialisation and residential intensification, mainly in the form of workers’ cottages. In the 1860s it was estimated that there were 4000 Catholics in Richmond, and the completion of the St Ignatius church in 1883 gave Richmond its most prominent landmark. It also proclaimed the importance of Irish Catholic influence in Richmond's municipal politics and parliamentary contests for the next 80 years. 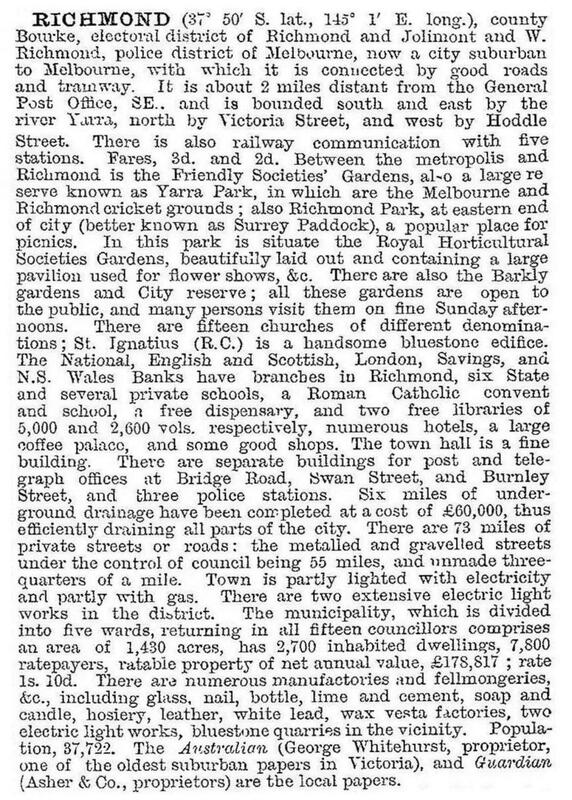 The Richmond borough was proclaimed a town in 1872 and a city in 1882. Tram services were opened in Bridge Road and Victoria Street in 1885 and 1886. State primary schools were opened, four between 1874 and 1878, and two more (Richmond North and Burnley) in the next decade. An exception to the picture of industrial servitude was the Bryant and May match factory (1909) in Church Street. By 1928 the factory provided its employees with dining and recreation rooms, tennis and basketball courts, gardens and a bowling green. Along with other large factories such as Bosisto's eucalyptus and Hardings crumpets, Bryant and May also gave slap-up Christmas parties. Bryant and May’s red brick factory was matched by the Vickers Ruwolt engineering works (1914) in Victoria Street next to the Yarra River and by Jaques Limited in Highett Street. Both were in manufacturing. The Vickers Ruwolt site was redeveloped for the Victoria Gardens shopping centre (including a massive Ikea showroom) and mixed commercial/residential uses. The Jaques factory was turned into apartments. On a smaller scale George Finsham’s organ factory in Stawell Street closed in 2006, but some of his instruments are heritage listed. Two are in Burnley Street, at the Anglican and Congregational churches. Smaller factories, however, were usually not so generous. Another landmark was the Wertheim piano factory in Bendigo Street, subsequently the Heinz tinned foods factory (1935) and the GTV9 television studio (1955). Richmond's premier retailing landmark is Dimmey's store in Swan Street. Built in 1907, the clock tower and the copper ball on top (1908-16) are widely recognised. Despite business failure in the early 1990s through a costly merger with Forges of Footscray, the Dimmey's name was retained in the refloated drapery business. In 2012 the site underwent transformation as the Richmond Icon Apartments around the historic Dimmey’s clock tower and Swan Street facade as a mixed use development of apartments, heritage lofts and retail. Like its neighbour, Collingwood, Richmond Football Club has fiercely loyal supporters. The ‘eat 'em alive’ club known as the tigers had won ten premierships by 1997. It joined the Victorian Football League in 1908. The slum abolition movement completed its first project in 1941 when it built on the land which had been leased to John Wren for the Richmond Racecourse (1907). Consisting mainly of clinker brick duplexes the estate is between Bridge Road and the GTV9 building, and its street names commemorated Richmond councillors. A high-rise public housing project in north-west Richmond, between Church and Lennox Streets, was completed during the 1960s. It later became part of the housing area occupied by immigrants from South East Asia, which signalled the transformation of the Victoria Street shopping strip to a predominantly Vietnamese business area. 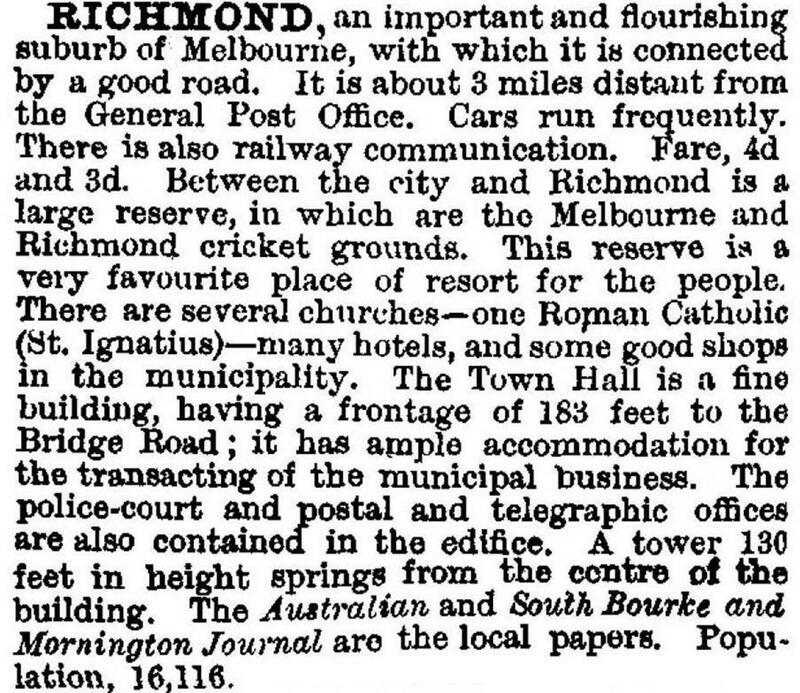 The Richmond Town Hall and surrounding areas have contained significant elements of social history and material culture. Until the 1980s the Town Hall area had the police station, a post office, Richmond baths and oval, a technical school (1926), a girls' high school (1926) and a primary school (1875). The Town Hall was the scene of intense contests between the Labor and Democratic Labour parties, the scene of Labor dominated municipal politics and it was the venue for meetings of trade unions. Family dynasties ruled the council and monopolised council seats, got friends and relatives council jobs, and were finally defeated by an enquiry into election rigging (1981). Reform minded candidates contested municipal elections after the Council had a spell under a State appointed commissioner. Physically the area changed with the closure of the three schools near the town hall, but a nearby open air Saturday morning street market continued, providing cheap fruit and vegetables for the locals. Richmond High school was opened in 1920 in a silvan site beside the Yarra River, looking across to Hawthorn's historic St James precinct. The girls' high school near the Town Hall was transferred to the high school, amidst much acrimony, and renamed the Melbourne Girls' College. In 1982 Richmond had six State primary schools plus one in Yarra Park, next to its border. Ten years later there were three. One of the primary school sites, along with the second technical school, had been converted to a Technical and Further Education College. There are three Catholic schools. The Vaucluse Convent secondary school for girls became a year 9 campus for St Kevins College, Toorak. The primary school (1935) is in Burnley Street. Between 1961 and 1991 the population of the Richmond municipality declined by about 11,000 persons to just under 23,000. Previously crowded family cottages were purchased by couples and a degree of gentrification entered Richmond. The change was reflected in house prices and the revitalisation of shopping strips, particularly Bridge Road. Clothes conscious young residents and bargain conscious shoppers made Bridge Road the factory seconds shopping capital of Australia. Bridge Road then became a fashion shops strip. Eateries also traded well. Victoria Street scarcely had a non-Vietnamese shop sign, and attracted locals for food stuffs and others wanting a well priced Vietnamese meal. Jesuit Publications, not out of place in Victoria Street in a Catholic Vietnamese community, began publishing an influential monthly in 1991, named after its back lane, Eureka Street. Between 1986 and 1996 the median house price in Richmond went from 93% of the median for metropolitan Melbourne to 136%. This remarkable change, however, contrasted with the fact that 60% of Richmond's children were in families on a welfare benefit or classed as working poor. Richmond's public open space is mostly in its southern and eastern areas. Its football club headquarters and training facilities are in Yarra Park (in neighbouring East Melbourne) at the refurbished (2011) Punt Road Oval where a Richmond museum (2013) opened in the Jack Dyer Stand. Its home ground is the Melbourne Cricket Ground and. The eastern area parklands are described under Burnley. On 22 June 1994, Richmond city was united with Collingwood and Fitzroy cities to form Yarra city. At the 2011 census, Vietnamese speaking residents were 6.6% of the population who expressed a language choice in the census. Greek speaking residents were 5.0%, a reflection of immigrant settlement in the 1950s to 1960s.